Rebecca Masson received her training at Le Cordon Bleu in Paris and received a coveted internship at Le Bristol Hotel. In NYC, she worked at Daniel Boulud’s restaurant, DB Bistro Moderne, transitioning to his flagship restaurant Daniel eight months later. In 2003, Rebecca joined the three-start Biltmore Room; in 2004 she was named Pastry Chef at the exalted Red Cat. 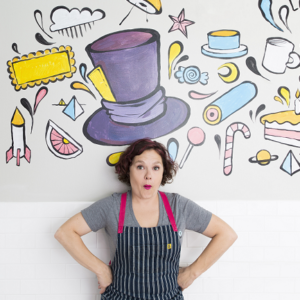 Strategically these experiences became a vital part of Masson’s pastry voice, inspiring the French technique based Americana tributes, with a flip that have made her a tastemaker in the Houston culinary scene. She was voted “Best Pastry Chef in Houston” during her tenure at *17 and again in 2015 by My Table Magazine and Culturemap Houston. Affectionately known as “The Sugar Fairy” Rebecca’s signature style creatively marries the tradition of French pastry with beloved homemade favorites reminiscent of childhood.